The Electro-Dynamic Light Company of New York was a lighting and electrical distribution company organized in 1878. The company held the patents for the first practical system of incandescent electric lighting. It was the first company formally established to provided electric lightning and was the first company organized specifically to manufacture and sell incandescent electric light bulbs. Albon Man, a New York attorney, and William E. Sawyer, an electrical engineer, officially formed the Electro-Dynamic Light Company of New York on July 8, 1878. This was by way of a partnership with Man supplying money for experiments. Sources in the late 19th century claimed it to be the first formally established electric-lighting company. The Electro-Dynamic Light Company was the first organized specifically to manufacture and sell incandescent electric light bulbs. Man and Sawyer patented the first practical system of incandescent electric lighting and gave the patents to the company. The United States Electric Lighting Company was organized in 1878, weeks after the Electro-Dynamic Company. The names of other investor-partners of the company besides Man and Sawyer were: Hugh McCulloch (Man's uncle), William Hercules Hays, James P. Kernochan, Lawrence Myers, and Jacob Hays. Sawyer was about 28 years old and Man about 52 years old at the time the company was formed. They planned on lighting New York City with electricity for one-fortieth the cost of gas lighting. The new company started with capital of $10,000 cash and $290,000 of scrip. It was formed for the purpose of the production of light and power by means of electricity for the lighting of streets and buildings. The company was to make all the equipment necessary to generate and distribute electricity. The distribution of electricity produced by the company was not only for lighting, but for other purposes as well. 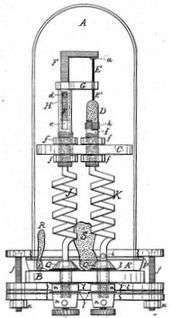 In 1878, the Electro-Dynamic Light Company demonstrated an electric light that was the invention of Sawyer and Man. An exhibition was set up in New York City on October 29, 1878. The same exhibition was mentioned several weeks later in a newspaper of Princeton, Minnesota, and Bismarck, North Dakota. The lamp was described as a strip of pencil carbon graphite connected with two wires to an electric generator. The carbon strip was in a hermetically sealed glass bulb that was filled with nitrogen gas. When electricity was applied, the internal strip developed a temperature of between 30,000 and 50,000 degrees Fahrenheit. Since there was no oxygen in the glass globe the carbon filament did not burn out and produced light instead. The demonstration consisted of five electric light bulbs hanging from chandeliers in an office building at the corner of Elm and Walker Streets. Wires came from the electric lights and went to an adjacent room where there was a generator set up to produce electricity. The wires passed through keyholes to the adjoining room. A key was put into the keyhole and turned to switch on the electric current. As the key was turned further around, the electric lights got brighter. This switch idea was demonstrated with all five chandeliers with the electric lamps. An electric meter to measure the amount of electricity used in an office or house for billing purposes was also demonstrated. Thomas Edison's electric lighting discoveries were first shown in September 1878. The Edison Electric-Light Company of New York was organized on October 17, three months after the Electro-Dynamic Company was formally established. The United States Electric-Lighting Company of New York was formed shortly after this to introduce the inventions of Hiram S. Maxim and Edward Weston. 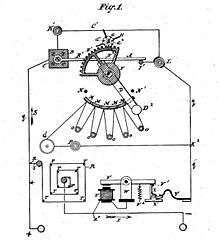 Patents were taken out by Man and Sawyer for all the items needed for electric current distribution. The patents were for the benefit of the Electro-Dynamic Light Company of New York. Man and Sawyer were involved in many legal actions between 1880 and 1884 to protect these patents for electric lighting. The Electro-Dynamic Light Company ceased to exist after 1881. 1 2 EE1890 1890, p. 72. 1 2 3 Pope 1894, p. 10. ↑ "Sawyer's New Incandescent Light for Illumination of Buildings". Chicago Daily Tribune. Chicago, Illinois. April 5, 1880. p. 7 – via Newspapers.com . ↑ Carnegie 2004, p. 196. ↑ Wrege 1986, p. 59. ↑ WE1890 1890, p. 36. ↑ ER1890 1890, p. 9. 1 2 3 "Another Electric Lamp". Democrat and Chronicle. Rochester, New York. November 1, 1878 – via Newspapers.com . ↑ "Another Electric Light / An Inventor who Proposes Household Illumination at One-Fortieth the Cost of Gas". The Belvidere Standard. Belvidere, Illinois. November 12, 1878. p. 7 – via Newspapers.com . ↑ "An Inventor Who Promises Illumination at One-Fortieth Cost of Gas". The Tennessean. Nashville, Tennessee. November 3, 1878 – via Newspapers.com . ↑ "The Electric Lamp / An Invention which finds an Important Manufacturing Center in Brooklyn – The Company which is Prepared to Carry the Work to Consumption". The Brooklyn Daily Eagle. Brooklyn, New York. October 14, 1883. p. 5 – via Newspapers.com . 1 2 3 NAR1889 1889, p. 654. ↑ "The Electro-Dynamic Light Company ready to Commence Operation". Chicago Daily Tribune. Chicago, Illinois. November 1, 1878 – via Newspapers.com . ↑ "A New Electric Light". The Princeton Union. Princeton, Minnesota. November 13, 1878 – via Newspapers.com . ↑ "A New Electric Light". Bismarck. Bismarck, North Dakota. November 18, 1878 – via Newspapers.com . 1 2 "A New Electric Light / The Electro-Dynamic Light Company / Ready to Commence Operations". The New York Times. New York City. October 30, 1878 – via Newspapers.com . ↑ "An Injuction against United States Electric Light Company asked for". National Republican. Washington, D.C. November 11, 1883. p. 3 – via Newspapers.com . ↑ ""William E. Sawyer and the Rise and Fall of America's First Incandescent Electric Light Company, 1878–1881" by Charles D. Wrege (Rutgers University) and Ronald G. Greenwood (GMI Engineering Institute). Business and Economic History, 2d ser., 13 (1984): 31–48". The Business History Conference. Hagley Museum and Library. Retrieved April 26, 2016. Carnegie, Andrew (15 May 2004). Success and How to Attain It. Cosimo, Inc. ISBN 978-1-59605-010-5. The first electric-lighting company ever organized, the Electro-Dynamic Light Company, was formed by Messrs, Sawyer and Man in 1878. NAR1889 (1889). The North American Review. University of Northern Iowa. In September, 1878, appeared the first announcement of Mr. Edison's discoveries in electric lighting, and on October 17, three months after the formation of the Electro-Dynamic Company to operate Sawyer and Man's electric-light inventions, the Edison Electric-Light Company, of New York, was organized. WE1890 (July 19, 1890). Western Electrician. Electrician Publishing Company. To protect its business and successfully defend itself in any litigation that might be forced upon it by its competitors, the company found it desirable to fortify its patent position. and to that end acquired the control of the Consolidated Electric Lighting company and the United States Electric Lighting company, both of New York. The Consolidated company was the successor of the Electro-Dynamic Light company of New York, the first company organized in the United States for the manufacture and sale of electric incandescent lamps, and the owner of a large number of patents of date prior to those upon which rival companies were depending. Wrege, Charles D. (1 January 1986). Facts and Fallacies of Hawthorne: A Historical Study of the Origins, Procedures, and Results of the Hawthorne Illumination Tests and Their Influence Upon the Hawthorne Studies. Garland. ISBN 978-0-8240-8374-8. On July 8, l878, Mr. Sawyer and Albon Man formed the Electro-Dynamic Light Company of New York, "The first electric lighting company ever organized,..."